Winning Fort Benton and Drummond. What is your horse(s)' style when running barrels? What special qualities does your horse have and what makes him/her unique? My horse’s running style is push, push then push some more. Junior is pretty layed back and stays very calm when tied to the trailer by himself. However, when it comes time to run barrels his whole personality changes and he becomes very anxious. I guess what makes him unique is that he can run pretty good with that big belly! 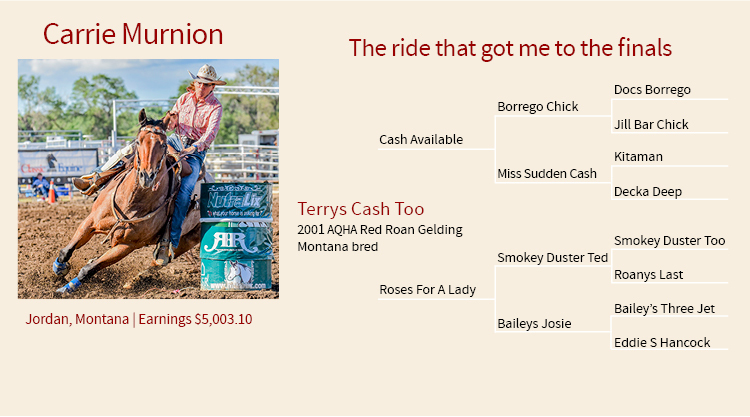 My favorite part of barrel racing is when I win money and have a traveling partner. Secondly, I really enjoy the life long friendships that have formed from participating in the sport of rodeo.